Πόλεμος πάντων μὲν πατήρ ἐστι, πάντων δὲ βασιλεύς, καὶ τοὺς μὲν θεοὺς ἔδειξε τοὺς δὲ ἀνθρώπους, τοὺς μὲν δούλους ἐποίησε τοὺς δὲ ἐλευθέρους. Heraclitus, Fragmentum 53. 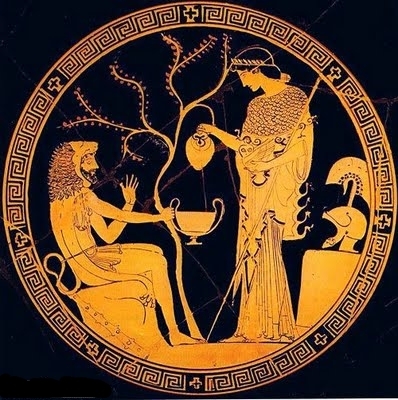 As for Πόλεμος – while Heidegger suggested a similarity with λόγος, Πόλεμος is in my view what the λόγος that is both causal and acausal knowing can uncover, rather than λόγος itself. That is, the ἀρχὴ of, the changing, the presencing and re-presencing of Being which is ψυχή through Αἰὼν. Hence Πόλεμος is the whole, the complete, the natural, the cosmological, process which includes ἀρχὴ, ψυχή, Αἰὼν, and Φύσις, and our revealing or coming-to-know these through λόγος. That is, through that thoughtful reasoning [σωφρονεῖν], that balance (ἁρμονίη) of both a causal knowing and an acausal knowing. In other words, by means of both empathy, and also by philosophy and experimental science. In effect, Πόλεμος is an expresion of the acausality beyond our causal ideation, the acausal nature of which both ψυχή and Αἰὼν manifest . It should be stressed that, correctly understand, Πόλεμος is, in my opinion, neither the struggle (Kampf) of Heidegger nor the common translation of war. Rather it suggests – as above – the fundamental acausality beyond Phainómenon: the presencing of Being as Change, and thus as beings, that has been interpreted, incorrectly because via causal ideation only, as a dialectic and thus as a conflict, or as conflict as idea. Neither is Πόλεμος the practical combat as in the Iliad (XVIII, 106) – contrasted with ἔρις in the next verse , as it is so contrasted in Fragment 80, attributed to Heraclitus. As such acausality, made manifest via ψυχή, Πόλεμος may be said to be the origin of Δίκα  in a similar way to Aeschylus attributing the numinous authority of πάθει μάθος to Zeus . Thus, our own nature as mortals is that we are part of this acausal change – we have our genesis (both our life, and our type of living) in this change, in and through and because of Πόλεμος. See, for example, my essays, On The Nature of Abstraction, and Empathy and the Immoral Abstraction of Race. For a brief overview of Δίκα, see my essay, On The Nature of Abstraction. Refer, for example, to my From Aeschylus To The Numinous Way.